With our high quality print service, we can now offer The Complete Solution for our snap frames, pavement signs and more! 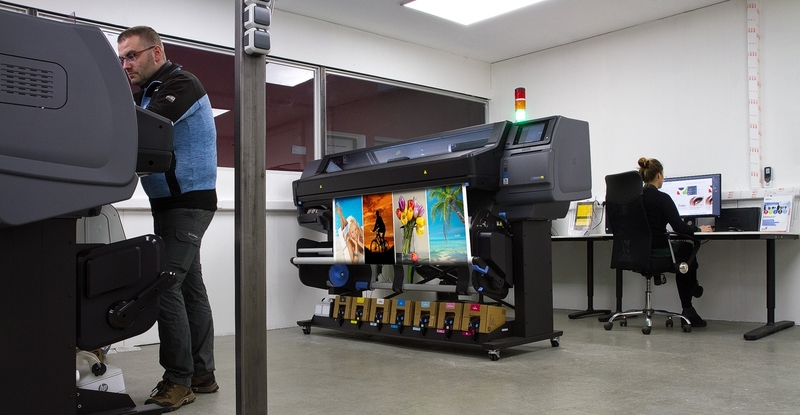 Using our HP Latex printers, we are able to print on paper, banners and even backlit materials. All prints are suitable for indoor and outdoor use. The print will be added to our high quality manufactured products ensuring your order is ready to be displayed upon delivery. We are very pleased the the results so far and we are confident you will be too. We print using HP Latex printers with HP Latex water based ink. Therefore, you can rely on a high quality printed product every time. All prints are anti-scratch and dry immediately after the printing is complete allowing us to complete your orders in a short time. We can work will a range of files including vectors & raster (bitmap) files. For best results, we suggest using Vector files - PDF, EPS & all other formats. If you want to use raster files, please provide the TIFF, JPG or PSD. Once the data/file has been submitted, we will send you a proof for approval. This allows us to ensure the quality is correct. There are 2 methods to share the information. Option 1 is for E-Shop orders. You will need to upload your files using the on screen instructions when completing your order. Option 2 - you will receive a link which is unique to your order. This will be sent with your order confirmation. You will then be able to upload any images/files required inside the link. There are various material types available, however we will select the most suitable based on specification and product use. To be used in Snap Frames, A-Boards, Windtalkers, Indoor Showcases and other paper poster products. Material type: Poster Satin Paper 135g/m2. Maximum print width is 156 cm. Ideal solution for illuminated products such as Illuminated Poster Frames and Pockets, Magnetic Poster Frames, Illuminated Totems, Showcases and all other LED products. Material type: Premium Backlit 200g/m2 (PET film), satin surface. Maximum print width is 150 cm. You can choose from two materials for your Banners and Roll ups. a) Premium No-curl PP film 220g/m2 with matt surface, 600x2000 mm. Maximum print width is 125 cm. Optimal solution for your Banners, Roll Ups, X-Banners and Frameworks. You can use it also with premium poster cases such as Frames and A-Boards. This material is currently the best option for large graphic presentations. It is very stable and produces amazing print quality. b) Symbio frontlit PP banner 510g/m2, matt surface, 1200x2000 mm. Maximum print width is 156 cm. This material is an economy alternative for Banners, Roll Ups, X-Banners and Frameworks.The print quality is of a lower standard than the Premium version. The only difference compared to the Premium No Curl film is only noticeable when viewing close-up. PWP Fabric for Backlit (100% polyester), ST-601UVO Starlight. Maximum print width is 156 cm. Your printed T-Frames will look stunning with this polyester based fabric ensuring a top quality print.